Registered in 2007 in the Sharjah Airport International Free (SAIF) Zone, in the Sharjah Emirate of the United Arab Emirates, for the purpose of Manufacture of Power Distribution Equipments, vide SAIF Zone Licence Certificate no.03-01-04976, DELTA ELECTRIC (FZE) have started operation from January 2008, by manufacturing LV Switchgears and LV Busway Systems under one roof for the first time in the U.A.E (and also in GCC Countries) by any Organisation. We manufacture ASTA Certified LV Switchgears from 125A to 2500A, under the Brand name DELTASWITCHGEAR, KEMA Quality Certified LV Busway Systems from 800/1000A to 6000A, under the Brand Name DELTABAR®. DELTA ELECTRIC is awarded the ISO 9001: 2008 Certification, ensuring that our Product Designs, Quality Systems and Procedures etc are of International Standards. M/s Delta Switchgear Industries LLC, P.O.Box 33390, Sharjah, a sister concern of Delta Electric, started manufacture of high quality Low Voltage Switchgears- ‘DELTASWITCHGEAR’- in 2004 in Sharjah. The ‘DELTASWITCHGEAR’ Designs were duly proven through Certification by ASTA, towards end of 2006, by Type Tests conducted at IPH Laboratories in Berlin. We are Approved Panel Builders for Siemens, as our Switchgears were Type Tested with Siemens Products. The only Establishment, particularly in GCC Countries, which manufactures under one roof, the following two high-tech Essential Products for Low Voltage Electricity Distribution, duly Certified by leading International , Independent Testing & Certification Bodies. DELTASWITCHGEAR - LV Switchgears – ASTA Certified. 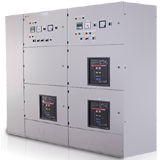 M/S Delta Switchgear Industries (DSI) – the Low Voltage Switchgear assembling unit started manufacturing custom electrical power distribution products and switchgear assemblies in 2002. Thereafter, our manufacturing and engineering capabilities have expanded quickly to fulfill the demand for a wide range of standard and custom – designed electrical power distribution equipment. DELTABAR - LV Busway Systems - KEMA Certified Praesent vestibulum molestie lacus. Aenean non endrerit mauris. Phamagnis dis parturient montes, nascetur ridiculus mus. Nulla dui fusce feugiat morbi nunc odio, gravida at, cursus. Phamagnis dis parturient montes, nascetur.